About the author: Jodi Helmer is a North Carolina-based writer covering food and farming topics. Her work has appeared in Hobby Farms, Modern Farmer, E: The Environmental Magazine, National Geographic Traveler, Hemispheres and Entrepreneur among others. When she’s not writing, she tosses balls for her rescue dogs, Molly, Milo, Roxie, Noelle, and Sampson; grows vegetables; and raises bees (and tries to keep her dogs from stealing strawberries and honey). With space at such a premium in Manhattan, New Yorkers are accustomed to thinking vertically when it comes to housing. 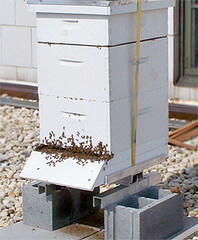 Now bees are getting in on the action. 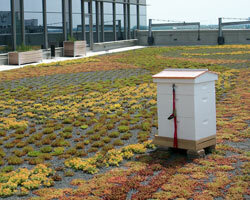 David Graves, an urban beekeeper, tends his hives far above the bustle of New York on rooftops throughout the city. His buzzworthy honey gets rave reviews for its delicate sweetness and for the relief it offers allergy sufferers. But with Colony Collapse Disorder threatening his livelihood, we’re left wondering what a world without honey bees would be like. Not so sweet.